Eureka Entertainment to release Jackie Chan’s Police Story and Police Story 2, two of the finest action films ever made from cinema’s reigning martial arts king, for the first time on Blu-ray in the UK on 20th August 2018, in a Limited Edition (3000 copies) Hard Cased Box Set. Two of Jackie Chan’s most iconic films explode onto Blu-ray from incredible new 4K restorations! Featuring some of the most dangerous stunts ever performed on camera, Police Story and Police Story 2 are a dazzling blend of gritty action cop drama and impeccably choreographed martial-arts sequences that revitalised the Hong Kong action genre and established Jackie Chan as a worldwide superstar. Police Story – considered by Jackie Chan himself to be his best film in terms of pure action, Police Story stars Chan as “super cop” Chan Ka-Kui, who goes up against a notorious crime lord in a series of escalating set-pieces that resulted in many of Jackie’s stunt team being hospitalised. 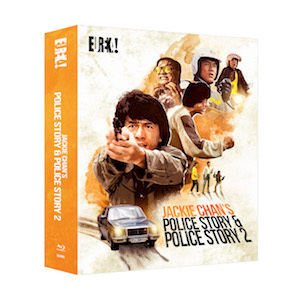 Presented from brand new 4K restorations and fully uncut, Eureka Classics is proud to present Jackie Chan’s Police Story and Police Story 2 for the first time on Blu-ray in the UK in a special Limited Edition (3000 copies) Box Set packed with extra content. Jackie Chan’s Police Story and Police Story 2, two of the finest action films ever made from cinema’s reigning martial arts king, is out now on BLU-RAY and can be purchased here https://amzn.to/2zZTDb8. The competition closes at 23.59 (GMT) on Sunday 26th August 2018.